But none of them ever seemed to work. He couldn't bank a winning trade to save his life. Now a self-made millionaire, he's on a mission to prove that his system can help anyone make thousands of extra dollars a month from the stock market – regardless of their age, income, or past investing experience. And the best part is – D.R's system really only takes 10 minutes to set up and implement each day. Absolutely any investor – regardless of age, experience, or the amount of money they start with – can use D.R. 's 10-minute system to pocket thousands of extra dollars a month from the market. After some losses in the markets, Gary tried D.R. 's system and made his first significant gain – and it was a whopper. 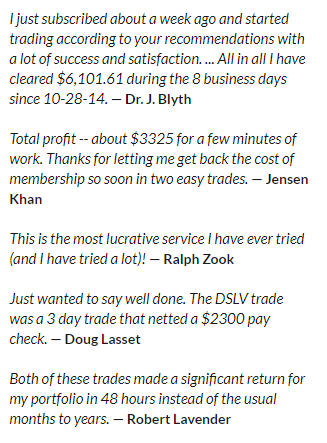 “I gained a big 922% profit. D.R's system has been very profitable and motivating,” Gary told us. Now he's seeing triple-digit profits. “No other win has compared in dollars to yours, D.R.,” he wrote. And Nathan Armstrong from St. Petersburg, Florida, really hit a jackpot, making an astounding $188,253 profit using D.R. 's system. You'll have the chance to learn directly with D.R. as he takes you under his wing and shows you step by step how to make these trades – and become a self-made millionaire from the stock market, just like him. It's been 30 years in the making, and we are so glad D.R. has made his system exclusively available to Money Map readers. In fact, many people refuse to believe that it's possible for them to achieve wealth – to become millionaires. They actually even raise a whole series of arguments or objections articulating why such good fortune isn't possible. The first thing it strives to give you is what D.R. calls the Millionaire's Mindset. And that's what's at the core of The 10-Minute Millionaire Insider. D.R. 's system is a very methodical approach. You see, markets are made up of people… meaning they're also a compilation of emotions… of fear… of greed… of predispositions… of likes and dislikes. And you can exploit these extremes for hefty profits… often at risk levels that are well below normal. Market extremes aren't just once-in-a-while opportunities that come along when the prices of individual stocks, business sectors, geographic economies, or entire asset classes get out of whack. But I'm going to let you in on a little secret… one that will short-circuit any fears you have – and ease your journey to 10-Minute Millionaire status. D.R. 's system pinpoints these extremes for you – and it only takes about 10 minutes. So you don't have to spend your entire day profiling stocks. That means, with very little work on your part, with the full extent of The 10-Minute Millionaire system, you'll know “how often” each extreme shows up in the financial markets. And “how much” you can expect to make from a trade properly executed against each extreme. D.R. 's system pinpoints these extremes, then shows you how to capitalize on them. The system only takes about 10-minutes to set up each day. After that, it works on virtual autopilot, finding and capitalizing on specific stocks that can dramatically grow the smallest portion – or worst performing part – of your portfolio. Step 1: Find the Extreme. There are more than 4,000 stocks on U.S. exchanges. But in any given day there are only a handful that will give you a chance to double or triple your money. D.R. 's system lets you screen thousands of stocks in mere seconds to pinpoint only the best trading opportunities with the biggest potential gains. Step 2: Frame the Trade. Knowing which stock to play is only half the battle. You also have to know exactly when to get into the trade – and how to set it up best to minimize risk. D.R. 's system does that expertly. D.R. will personally guide you through the different facets of this 10-Minute Millionaire Insider system. He'll show you how to establish goals and stick to them. He'll demonstrate how to adapt his strategy to your circumstances. He'll guide you through the three moving parts of his system – so you'll get to see, up close and personal, how simple it really is. He'll teach you how to Find the Extreme – identify when a particular opportunity is out of whack – has achieved an extreme – and the precise moment when the odds of initiating a profitable trade are overwhelmingly in your favor. His system is so simple that you'll learn how to execute these steps, and execute them quickly. And there will be endless opportunities to capitalize on them.